Cottagepaneer marinated in Indian herb & Spices, Dipped in Special Batter & Deep Fried Served with tamarind sauce. Deep-fried spiced eggplant seasoned with special masala thinly coated with chic pea flour. Deep-fried spiced Spinach seasoned with special masala thinly coated with chic pea flour. Deep-fried spiced potato seasoned with special masala thinly coated with chic pea flour. Mushroom cooked with fresh ginger garlic and yoghurt. An amazing chicken fritters made using boneless chicken and chickpea flour. Chicken strips marinated in yogurt, lemon juice & selected herbs. Prawns cooked with fresh ginger garlic and yoghurt. Delicious fish morsels marinated with fresh garlic, Mustard oil and aijwain seeds. Paneer pieces cooked in red medium spicy gravy with cashew nut paste in it garnished with grated paneer. Cubes of fresh cottage cheese cooked with tomatoes in spinach puree and finished with fenugreek leaves. Dices of paneer and capsicum cooked together in medium spicy thick gravy. Dices of paneer cooked in tomato base sweetish gravy. Cottage cheese dumplings stuffed with raisins and finished in a rich creamy tomato and cashew based gravy. Dear patrons, to avail the Banquet menu, a minimum of 4 persons are required. Onion bhaji, Seekh kebab, Butter chicken, lamb vindaloo, Malai kofta, Dal makhani,Rice, Naan, Raita, Pappadam. Haryali kebab, Chicken tikka, Rogan josh, chicken pepper masala, Paneer butter masala, Vegetable korma, Rice, Naan, Raita, Pappadam. Aloo papdi chaat, Chicken tikka, Tandoori fish, Chicken korma, Gosht hara masala, Channa masala, Beef coconut fry, Dal tadka, Rice, Naan, Raita, Pappadam, Gulab jamun. Onion bhaji, Samosa, Seekh kebab, Chicken vindaloo, Saag Lamb, shahi paneer, Dal tadka, Rice, Naan, Raita, Pappadam. 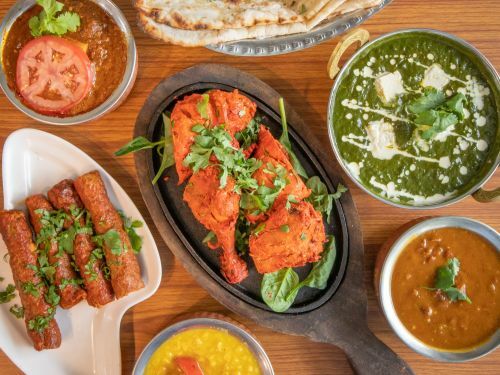 Aloo papdi chaat, Chicken tikka, Fish Tikka, Malai kofta, Aloo palak, Chicken pepper masala, Rogan josh, Beef Vindaloo, Rice, Naan, Raita, Pappadam, Gulab jamun. Veg. Pakora, Samosa, Chicken tikka, Seekh kebab, Vegetable korma, Palak Paneer, Butter chicken, lamb vindaloo, Goan prawn curry, Rice, Naan, Raita, Pappadam, Gulab jamun. Barbecued boneless chicken cooked in rich tomato base creamy gravy, finished with fenugreek. A Spicy treat from the Chettiar's family of Tamil Nadu. Indian style chicken stir- fry, served on a sizzler plate. Punjabi's favourite dish made with pure of spinach, spices and touch of cream. A true Goan dish influenced by Portuguese settlers. This authentic spicy Goan style dish of boneless meat cooked with garlic, malt vinegar, red-hot chillies & fresh herbs. A Spicy treat from the Chettiyar's Family Tamil Nadu. Tender lamb in thick gravy made with the spices special to the region of coorg. Punjabi's favourite dish made with puree of spinach, spices and touch of cream. Plain yoghurt mixed with mild spices salted boondi.